Joe Manning’s quick feet has earned him a spot on Dallas Baptist University’s Patriot track team for next year. 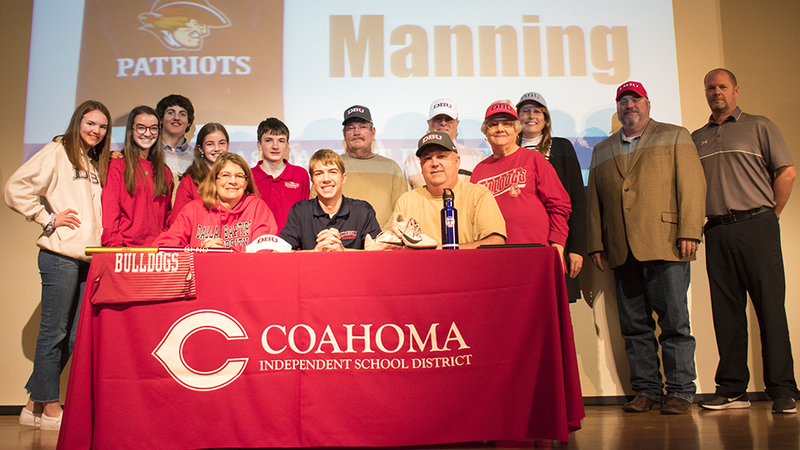 Manning signed his commitment papers to the NCAA Division II program with his mother, Brandy, and father, Jimmy, on either side of him while the rest of his family gathered around during an all-school assembly Thursday. Head Football Coach and Athletic Director Chris Joslin describes Manning as an athlete who exemplifies the four golden rules of the Coahoma ISD athletic department: Be a great teammate, play relentlessly, trust your coaching, and details matter. Besides a stellar track and field competitor, Manning also plays football and basketball at the varsity level. He is a stand-out academic and student leader at CHS. Manning is a member of the National Honor Society, serves as president of his senior class and the student council and is involved with both FCA and First Priority. While attending DBU, Manning plans to study business administration and is considering a minor in kinesiology. Dallas Baptist University is a higher education institution located in the Dallas metroplex with approximately 4,700 students and offers undergraduate to doctoral level studies.